From the Chairman of the U. S. House of Representatives Homeland Security Committee, a gripping look at the most dangerous and unexpected threats to our national security-and the actions needed to protect us. America is overwrought with fear. Serial killers, terrorist groups, nuclear attacks, deadly pandemics-every day a new headline hits, warning of the next inevitable catastrophe that will bring the country to ruins. The media fans embers of threats into fires that stir the entire nation into terror. But little do the American people know, the most real and imminent dangers to the country are the ones we've heard about the least and are doing the least about. Congressman and Chairman of the Committee on Homeland Security, Michael McCaul, has spent years in Washington watching the administration turn a blind eye to the most pressing possible threats to the country. 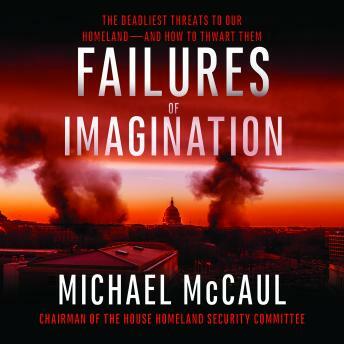 Now, in Failures Of Imagination, McCaul turns away from the over-sensationalized, unrealistic fears circulated through the media in order to expose the most legitimate and looming national security threats, which have long been swept under the rug by the administration. In his book, McCaul details the most pressing threats to our country based on his deep knowledge of our national security readiness, and advocates for the action needed to protect us from them. In stunning detail, he depicts the truth behind these hazards that are closer than we realize-from well-researched patterns that depict the issue's growing urgency, to the past responses (or lack thereof) from the administration-and provides potential solutions for the government to take in order to keep Americans safe. As the 2016 presidential election quickly approaches, Americans must turn their attention to these real and present dangers, and demand an administration that will combat them with the seriousness and urgency they require. Congressman Michael McCaul represents the state of Texas as a Republican in the US House of Representatives. Raised in Dallas, he attended San Antonio's Trinity University, then Harvard. He was elected to Congress in 2005 and appointed the chairman of the Committee on Homeland Security in 2013.